The Duke Company now caries Frami Xlife concrete forms by Doka. The Frami Xlife panels are known for high-performance, safety and workplace accessories. The panels are lightweight and easy to handle. They can be quickly erected with or without a crane. Its modular design accommodates a variety of job site conditions. The Duke Company can assist you with all your construction needs. We offer expert advice from our highly rated customer service. Furthermore, we offer the best values and fast delivery. For exceptional customer service & the fastest delivery in Upstate New York. Call us for a prompt rental quote 585-292-9870  (Rochester NY) and 607-347-4455  (Ithaca NY). The corner solutions are based on the strong, torsion-proof Frami inside corner. The Frami outside corner is an easy and pproblem free way of forming corners in narrow trench situations or where large wall thicknesses are called for. The Framax stripping corner is compatible to the Frami, making stripping a core a snap. Just a simple ratchet action in each corner and all is ready to be set into the next floor. Frami uses a lightweight high strength taper tie 1″- 3/4″ with 5/8″ ends. It combines the advantages of the taper tie with the convenience of the Doka Super plate, only one size and only one piece for each side. She bolts are also available when inner units with water stop are required. The Frami safety tie off handles meet the OSHA requirements. 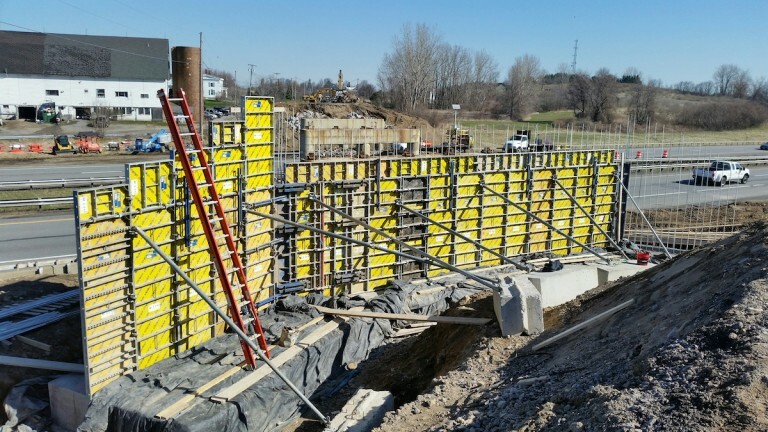 On this residential building, Frami is used to form 9 ft. high basement walls. Only one size panel width is required to form columns of any dimension in 2″ increments.